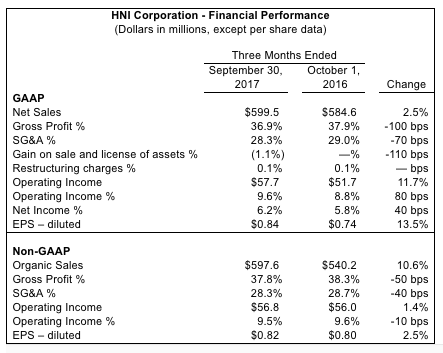 HNI Corporation (HNI) today announced sales for the third quarter ended September 30, 2017 of $599.5 million and net income of $37.3 million. GAAP net income per diluted share was $0.84 compared to $0.74 in the prior year. Non-GAAP net income per diluted share was $0.82 compared to $0.80 in the prior year. GAAP to non-GAAP reconciliations follow the financial statements in this release. "We drove strong growth during the third quarter and delivered earnings as expected. We continue making progress on several significant business transformation initiatives, positioning our businesses for long-term profitable growth," said Stan Askren, HNI Corporation Chairman, President and Chief Executive Officer. Consolidated net sales increased $14.8 million or 2.5 percent from the prior year quarter to $599.5 million. On an organic basis, sales increased 10.6 percent. The net impact of acquisitions and divestitures of small office furniture companies decreased sales $42.5 million compared to the prior year quarter. GAAP gross profit margin decreased 100 basis points compared to the prior year quarter. Of this decline, 50 basis points were driven by unfavorable product and business mix and input cost inflation, partially offset by higher volume and the impact of divestitures. The remaining decrease of 50 basis points was due to higher restructuring and transition costs. Selling and administrative expenses decreased as a percentage of sales due to lower incentive based compensation and the impact of divestitures, partially offset by strategic investments. The Corporation recorded $2.3 million of restructuring costs and $3.6 million of transition costs in the third quarter in connection with previously announced facility closures and structural realignments. Of these charges, $5.1 million was included in cost of sales. Specific items incurred include accelerated depreciation and production move costs. The Corporation also recorded a $6.0 million nonrecurring gain from the sale and license of a previously acquired intangible asset and an $0.8 million gain on the sale of a closed facility in the third quarter. Office furniture net sales increased $10.4 million or 2.3 percent from the prior year quarter to $465.3 million. On an organic basis, sales increased 12.9 percent driven by increases in the North American contract, supplies-driven, and international businesses. The net impact of acquisitions and divestitures of small office furniture companies decreased sales $42.5 million compared to the prior year quarter. 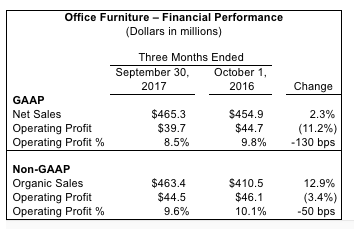 Office furniture GAAP operating profit margin decreased 130 basis points. Of this decline, 50 basis points were driven by unfavorable product and business mix, input cost inflation, and strategic investments, partially offset by higher volume, lower incentive based compensation, and the impact of divestitures. The remaining decrease of 80 basis points was due to higher restructuring and transition costs. Hearth products net sales increased $4.4 million or 3.4 percent from the prior year quarter to $134.1 million driven by increases in the new construction and retail businesses. 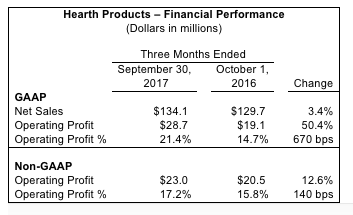 Hearth products GAAP operating profit margin increased 670 basis points. Of this increase, 140 basis points were driven by structural cost reductions and higher volume. The remaining increase of 530 basis points was due to nonrecurring gains and lower restructuring and transition costs. "We are expecting a significant decline in our fourth quarter profit as we work through two major challenges. First, we continue to confront highly dynamic conditions in our supplies-driven office furniture business, resulting in increased investment and lower near-term sales. Second, our operational transformations have been more difficult than anticipated, resulting in higher costs. "We are confident in our ability to meet these challenges. Our supplies-driven business has market access, brands, and scale unmatched by its competition, even in this new environment. We are establishing direct service capabilities which will provide economic advantages to our dealer partners with improved responsiveness and delivery. We are confident we will stabilize our transformations and return to driving cost improvements and continue to grow the top line," said Mr. Askren. The Corporation estimates full year 2017 non-GAAP earnings per share to be in the range of $1.88 to $1.95, which excludes restructuring and transition costs and other nonrecurring gains. This compares to prior guidance of non-GAAP earnings per share of $2.35 to $2.55. Lower fourth quarter volume in the supplies-driven business, higher costs related to operational transformations, and unfavorable business and product mix are primarily driving the reduced outlook. For the fourth quarter 2017, the Corporation expects sales to be flat to down 3 percent. Fourth quarter organic sales, which exclude the impacts of acquisitions and divestitures, are expected to be flat to up 3 percent. Fourth quarter non-GAAP earnings per share are anticipated to be in the range of $0.38 to $0.45, which excludes restructuring and transition costs. To focus on taking care of customers and strengthening its operational network, the Corporation proactively elected to move the next Business Systems Transformation implementation phase to February 2018, a historically slower demand period. "We are confronting our challenges and responding to these dynamic conditions. We remain optimistic about our opportunities to drive profit improvement," said Mr. Askren. The Corporation estimates full year non-GAAP earnings per share for 2018, which excludes restructuring and transition costs, to be in the range of $2.15 to $2.65 with consolidated organic net sales up 2 to 5 percent.